Ladies Flannel Nightgowns Cherries and Leaves in 100% ring-spun cotton sizes Small to 3X-Large in a medium weight (5 oz./sq yd.) and Blackwatch Plaid (4 oz./sq yd.). 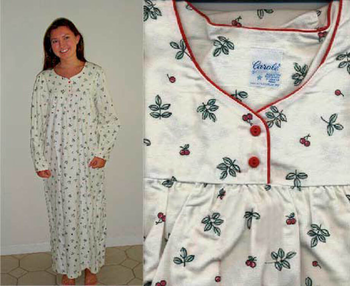 This Nightgown features a long (52 inch) length, long cuffed sleeves, 6 sizes for a perfect fit, button front, and white buttons (no pockets - no red bow). Machine wash and dry. Quality made in the USA of imported fabric in a full cut to allow for shrinkage. Sizes 2X-Large and 3X-Large are $3 more per nightgown. 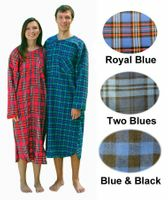 MEASUREMENTS: Our Ladies Flannel nightgowns are all made in the USA by the same company and have the above measurements (before shrinkage - shrinkage would probably be 1 inch across, Armhole to Armhole and 2 inches in length.